The original photos sent by the customer showed a broken handle. The sticker on the underside of the trophy said, "Protected by Invicta Do Not Polish." This sticker made me think that this trophy was most likely lacquered. Yikes! The customer did not have the missing portion of the handle. There is no such thing as replacement parts for trophies. Replicating the missing portion of the handle was not going to be easy. I provided a "guestimate" by email. This vintage trophy arrived with a lacquer coating that was so discolored it was yellow to orange. The customer thought it was supposed to look that way, but I was suspicious from the start. The color was very irregular. and this trophy was not gold plated. Removing the trophy cup from the base revealed a silverplated area that had not been exposed to sunlight so it had not yellowed. This was proof that the trophy was supposed to be a silverplate color. After removing the lacquer very carefully the trophy already looks much better. I sent this photo (above) to the customer so that she could witness this remarkable progress. Next was fabricating the missing handle part from sterling. Since this is a silverplate trophy, sterling silver will match very closely to the silver plated finish. It is not the best idea to replate these old trophies. Most trophies like this were not the best quality to start with.. In this case the trophy is silverplate over pot metal. The silverplating is barely adhering to the base metal. If I can preserve the silverplating, and the customer doesn't expect a flawless outcome, this is the best approach. even if it is not perfect. The engraving on the trophy will be crisper if it is not replated. The trophy also keeps more of it's vintage character. Why should a 76 year old trophy look like new anyway? Sterling silver was used to replicate the portion of the missing handle. It was a very complex form, and it had to be carved to fit the top of the fluted trophy cup and the rest of the handle. Fabricating the silver form to match the other handle was very challenging. I worked on it over a couple of weeks to renew my patience considering the difficulty. In this photo the trophy looks perfect. It is not. There are many small blemishes in the plating from the previous 76 years. 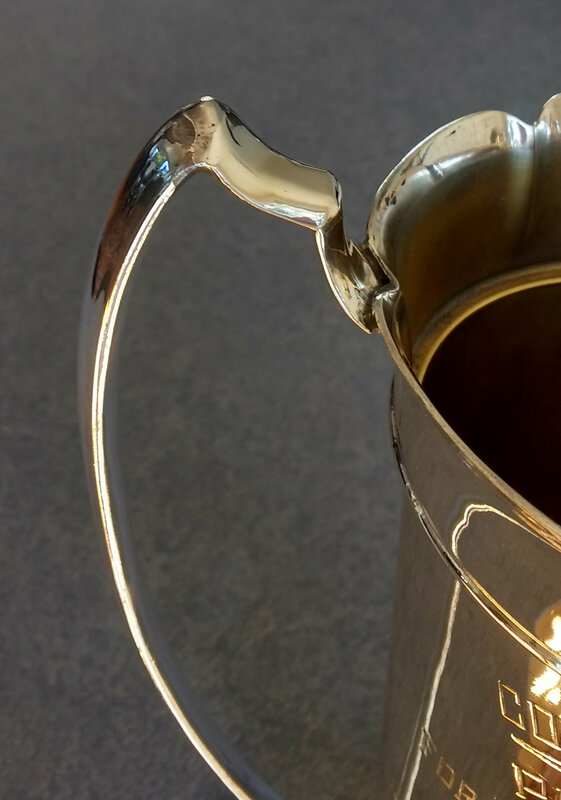 The handle was soldered at three locations on the trophy: at the top of the cup, at the peak of the handle and on the side. Every where that the trophy was soldered, the plating is a little unhappy, lifting just a speak from the pot metal surface. This is because the base pot metal melts very close to the solder temperature. Working on these old trophies requires great skill. The plating is very fragile. The base metal has very little strength. Everything has to be done extremely carefully. There is no room for mistakes. 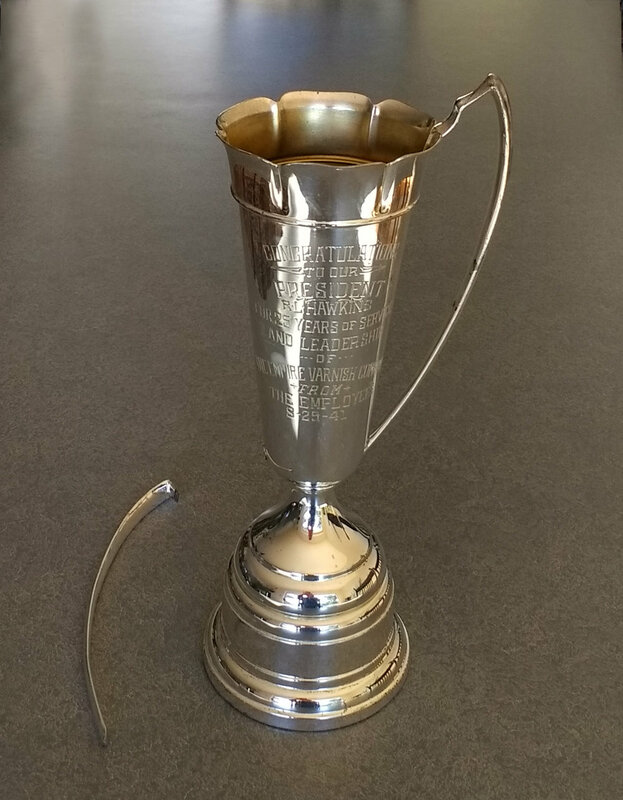 After the trophy is repaired, I will let you know the total for the repair, shipping, and shipping insurance. The customer can send a check by mail. The box is ready to ship. Always remember to contact me before shipping your trophy. The box needs to be big enough for the entire trophy after the repair. My Shipping Guidelines can be found here. In the photo below you can see another trophy where the stem was filled with glue. It took me hours to remove the glue in the stem of this trophy.